Amerks Give Up 5 for the Second Straight Game · Let's Go Amerks! 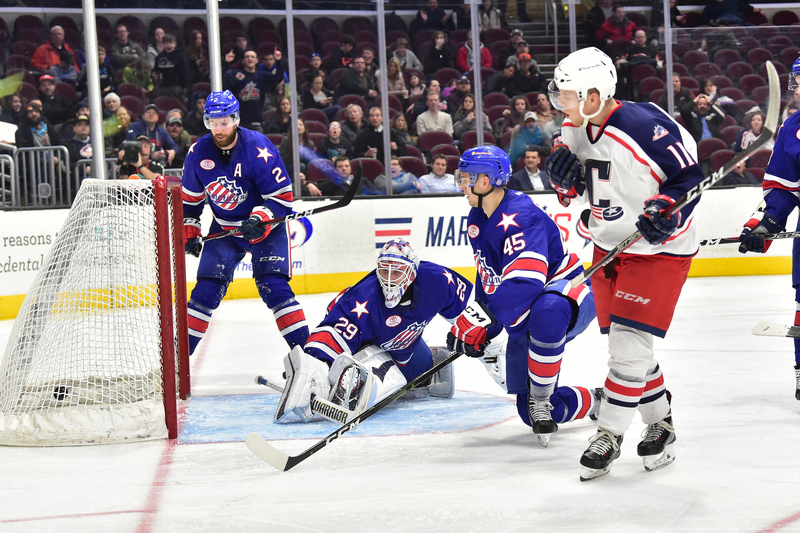 The Rochester Americans traveled to Cleveland on Tuesday and lost their second straight game on the road and second straight game giving up five goals. Three of which were in a short amount of time yet again. It was the fifth meeting of the season between the two teams and the first win for Cleveland by a final score of 5-2. Rochester had outscored the Monsters by a combined 14-4 over the previous four games. Kole Sherwood opened the scoring at 15:53 of the first period with a baseball move batting the puck out of mid air and into the back of the net. As Casey Nelson and Brendan Guhle chased the play behind the net Sam Vigneault was able to clear it out front. Remi Elie scored his first goal as a Rochester American at 2:46 of the second period to tie the game 1-1. Eric Cornel created a turnover at center ice and Elie took off on a breakaway and scored off the back hand. Through the rest of the game he was tied with Wayne Simpson registering five quality shots on net. It was a new game going into the final 20 minutes with the scored tied 1-1. Rochester had a 19-16 advantage in shots going into the third as well. This is where the game tilted towards the Monsters and they never looked back. Vitaly Abramov scored at 4:23 of the third period after a defensive turnover in the Rochester end. Andrew MacWilliam initiated the hit along the boards and as the puck popped out into the circle the Amerks were unable to gain control as Myles Powell had the chance. A quick pass from Nikita Korostelev to Vitaly Abramov who was able to score as Brendan Guhle had his back turned. Rochester had a power play opportunity shortly after the goal was scored against but wasn’t able to capitalize. They had a few shots but the Monsters limited the quality of those. Taylor Leier had the best chance to tie the game with a breakaway shot that went wide after Jean-Francois Berube was able to get a piece of the puck. The Monsters scored two goals in a span of 1:40 to take a 4-1 lead and the game was over at that point. Slight improvement after the Amerks allowed three goals in a span of 58 seconds on Saturday night. Nikita Korostelev carried the puck into the Amerks zone along the boards, passed it to Ryan MacInnis who fired a shot on net and Vital Abramov crashed the net and was able to poke in the rebound. Andrew MacWilliam and Matt Tennyson were the two defenders back and were beat as the Monsters crashed the net. Kole Sherwood gave his team the 4-1 advantage by putting his stick in the air and redirecting a high shot by Adam Clendening. Amerks argued it was a high stick but the refs disagreed. Matt Tennyson was the player covering Sherwood in front of the net. The puck was redirected under the arm of Wedgewood. Wayne Simpson scored less than a minute after the fourth goal against to get within two goals and create a better chance of a comeback. Remi Elie worked the puck along the side boards to gain possession of the puck. Elie sent a pass up ice to Casey Nelson who fired a knuckle puck that was redirected in by Simpson for his 16th goal of the season. Scott Wedgewood was pulled with just under three minutes remaining but an empty net goal sealed the win for Cleveland. Brendan Guhle lost the chase for the puck against Dan DeSalvo who was able to feed a pass to Paul Bittner for the empty net goal. Offensively the team had chances but the Monsters defensemen were better. The Amerks can withstand off games from one defensemen but not three. It wasn’t a good game for Guhle, Tennyson, or MacWilliam. Casey Nelson wasn’t expected to have his conditioning assignment last longer than three games but as the Amerks struggle (Nelson has played well) we’ll find out soon enough if he stays longer to help out. Seems unlikely the Sabres would make a decision like that but stranger things have happened. The team has Wednesday off and returns to practice Thursday before taking on a three in three weekend. Two games vs Syracuse and one vs Binghamton. Syracuse plays on Wednesday night and with a win has the chance to match the Amerks in points in the standings. Rochester has enjoyed first place all season and to stay in that place it’ll require a big weekend ahead. The Amerks were without Kevin Porter, Kyle Criscuolo, and Alex Nylander again. Zach Redmond isn’t expected back until next week. A team built on depth can’t use injuries as an excuse but it appears to be taking a toll. Combine that with CJ Smith being up in Buffalo and it’s a team finding it’s way again. Kevin Porter – lower body – day to day – Finished the game 2/9. Missed practice 2/11. Kyle Criscuolo – lower body – day to day – Left the game early 2/8, missed the game 2/9, and practice 2/11. Alex Nylander – upper body – week to week – Hurt in practice 2/5 from a hit. Missed the following three games. Zach Redmond – Lower body – week to week day to day week to week – Last minute of the game 1/23 he fell awkward into the boards, had to be helped off the ice. Possibly back the 2nd week of February.Changed to day to day on 2/4, returned to practice 2/6. Expected back February 20th. Sean Malone – unknown – week to week – Didn’t travel to Toronto on 1/12, has been out of practice since. Lingering injury, decision was made to go out for recovery. Hasn’t returned to team practice yet. Andrew Oglevie – Concussion – indefinite – Occurred during the game on 11/30. Has started working out again. Returned to team practice 2/4 in non contact jersey. Will take some time to get back into game shape. CORRECTION – Wayne Simpson tipped it in front and gets credit for the goal. Assists to Nelson and Elie.